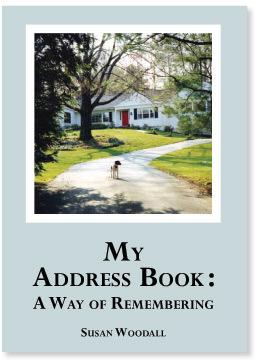 “My Address Book: A Way of Remembering” can be a template for your own memoir. It can be a gift to your family, as well as to yourself. The act of remembering can be pleasurable, i.e., nostalgic, or it can be painful. If it is painful, we often try to repress it. Or, we remember it in a skewed way, not often accurately or rationally. But, in delving into our pasts, and looking at records and photographs, we can see patterns, nuances, and relationships that we might not have been aware of by simply thinking about the past. The use of concrete tools of recorded history helps us to assess our remembering in a more objective way. I am offering a workshop series to help and guide you to create your own Address Book.Sign up to receive details of upcoming workshops. Now Available - Order online.